There was never any doubt that John Surtees would succeed as a motorcycle racer. From the time, in his mid-teens, he passengered his father Jack in a Vincent-powered sidecar at Brands Hatch grass tracks to beating the great Geoff Duke as a 21-year-old Norton works rider. Being his dad’s passenger was no easy job and resulted in occasional thick ears when things didn’t go right. But it was a great learning experience which, when allied to an apprenticeship at the Vincent motorcycle factory, created a determined but technically knowledgeable rider which was to hold him in great stead later on his career. Surtees had great success at Norton but in his own single-minded way decided that the path to world success was with an Italian factory and a four-cylinder machine. Added to that, Norton weren’t prepared to pay him much money. So, he accepted an offer from MV Agusta - following in the footsteps of Duke who had earlier gone to Gilera - and promptly won the 1956 world 500cc championship. It has to be said that he was helped by the FIM imposing a suspension on Duke for leading a riders’ strike at the Dutch TT. He won three more world 500cc championships and an equal number of Senior TTs, the latter years made more easy by the withdrawal of Gilera and Moto Guzzi. His team-mate during this period was John Hartle, also ex-Norton, who said of him: “He is the best rider I have ever ridden against.” As this was the period of Mike Hailwood, Bob McIntyre, Derek Minter and other greats of that era it was a considerable compliment. With nothing more to achieve in bikes, Surtees’ interest turned to cars. He had a Ferrari for road use and Hartle often travelled over the Alps with him. “I knew he would make a very good Grand Prix driver,” he said. Surtees caught the eye of Colin Chapman and, driving a Lotus, finished second at the 1960 British Grand Prix - his very first race. What followed was a highly successful F1 career, including a period with Honda, highlighted by winning the world championship for Ferrari in 1964. His natural inclination towards the technicalities of racing drew him to building his own cars and in 1972 his car won the European Formula 2 championship with Mike Hailwood at the wheel. The recipient of many honours, including the MBE, OBE and CBE plus the Segrave Trophy for services to motorsport, the Surtees family suffered a great tragedy when son Henry was killed racing in a Formula 2 championship at Brands Hatch in 2009. Surtees was the first racing motorcyclist I ever saw. 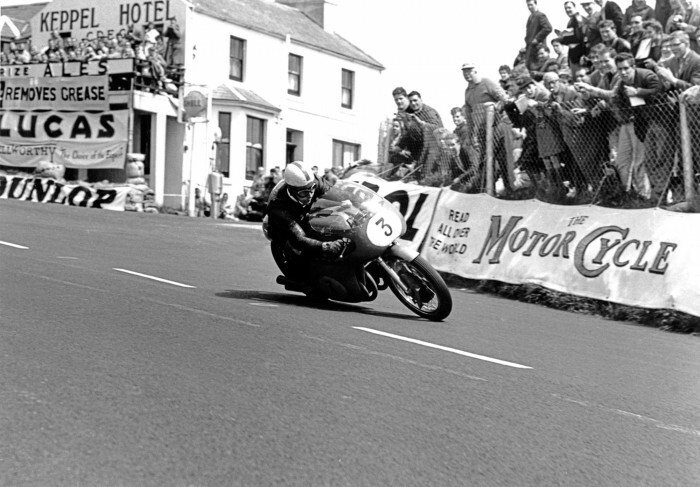 It was the 1960 Senior TT and together with a motley crew of fellow day-trippers, not-so-fresh from the overnight Heysham ferry but fortified with Manx breakfast at a greasy spoon on Loch Promenade, we made our way somewhat wearily to Hillberry. The roads were still open, crowds still arriving and bikes still circulating. Triumph, BSA, Matchless, AJS, Royal Enfield plus the occasional sight, and sound, of the iconic Gold Star. Barbour jackets and pudding basin helmets were the order of the day. Suddenly, everything went quiet bar for the chatter of the spectators reminiscing of the time, three years earlier, when Bob McIntyre on a fully-faired works Gilera broke the 100mph lap barrier for the first time. The roads were closed, a rope was strung across the side road leading to Onchan, we shuffled forward ‘til our feet were on the track itself and waited. But hang on. This was not Surtees, Hartle, McIntyre, Minter or Hailwood. It was a road marshal, former Manx star Bob Dowty, no slouch he on a Matchless GCSR. Not intended as an appetiser to the real thing it was nevertheless impressive to a complete newcomer. I had never seen anything like it. But when Surtees arrived it was like something from another world. The four cylinder MV, now leading the field, could be heard more than three miles away at Kate’s Cottage. And when it exploded into 120mph Hillberry, it’s black leather clad rider flat on the tank, it was just hard to believe that a human being was on board that red engine. It still is, first impressions are very powerful. Surtees had won three Senior TTs in succession. He went onto win a fourth 500cc world championship and then moved into cars where history was made. But it was that first impression which never left a 20 year old for whom motorcycle racing became much more than just an interest.